Net Weight: Packet (20 seeds)1oz (1600 seeds)(+$9)1/4lb (6400 seeds)(+$26)1lb (25600 seeds) (+$61) This item is currently out of stock! A colorful blend of 5 different improved patty-pan semi-bush summer squash. 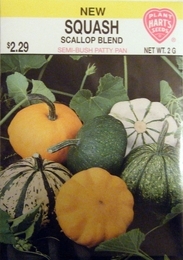 Each variety a different color; creamy white, yellow, pale green, green stripe, and dark green. Pick fruit when young and under 4 inches for best flavor. The Five varieties; Moonbeam, Sunbeam, Lunar Eclipse, Partial Eclipse, and Total Eclipse. Each unique, can be allowed to mature on the vine for decorative fall displays. Thinning - Avoid thinning if possible, this blend will produce plants from each variety. Let them grow to see which ones you get!